Our philosophy is that the cornerstone of Medicaid Planning is the education and training of advisors on the proper ways to plan for the high cost of long-term care. The Medicaid Planning rules are designed to encourage planning – yet most people wait to do their planning until a crisis strikes. A Medicaid Planner can help someone who wants to be prepared in advance. But most people are surprised to learn there is still much that can be done even if someone is on the nursing home’s doorstep, has already entered the nursing home or has been in the nursing home for a length of time. Learning all that can be done – even if it’s not your primary vocation – will help you become the best advisor to seniors possible. This issue is so prevalent that if you work as an advisor to seniors and don’t understand basics of long-term care financing issues, you’re doing a disservice to your clients and you could be giving the wrong advice. Our system is the fastest way to go from “I don’t know” to “I’m a pro.” There’s nothing else like it. 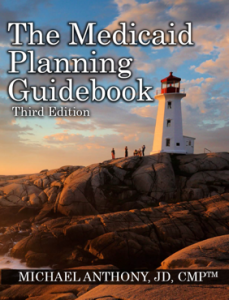 Medicaid Planning Guidebook – The biggest, most comprehensive book ever printed on Medicaid Planning. It starts with the basics and carefully walks you through every aspect of long-term care financing in the US. Learn the rules. Learn the exception to the rules. See the planning and advocacy techniques used by practitioners around the county. The book starts with the federal rules and works its way through how states implement those rules and covers state-specific exceptions or deviations. It’s all in there. 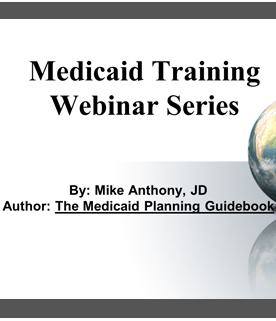 Medicaid Planning Course – Some people learn best by reading the book. Some people learn best with an audio-visual presentation. 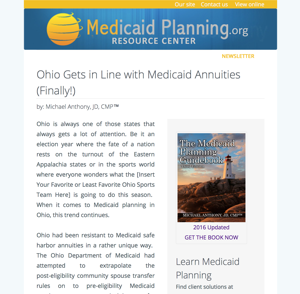 We want all advisors to learn Medicaid Planning in the easiest and most convenient way possible that suits their needs. The Medicaid Planning Course teaches the Guidebook in a simple, easy-to-understand video format. You get access to the course for a full year to watch and re-watch as needed. Personalized Training – We can customize training for companies and large groups with in-person or live online presentations. From short single-topic webinars to multi-day Medicaid Planning boot camps, we can help customize a training program that fits your need. It’s often said that a rising tide raises all ships. We invite you to be a part of the rising tide advisors who strive for excellence by learning Medicaid Planning at a level that meets your practice requirements.